The Third Batch Partnership’s Commercial Cattle Breeding and Management Training is commencing on the 1 st April 2019 in in collaboration with Gadjah Mada University (UGM) Yogyakarta. on the 1 st April 2019 in in collaboration with Gadjah Mada University (UGM) Yogyakarta. The training was attended by 20 participants from all over Indonesia who were players in the beef cattle industry, integrated cattle oil-palm plantation, as well as commercial cattle breeders and farmers. 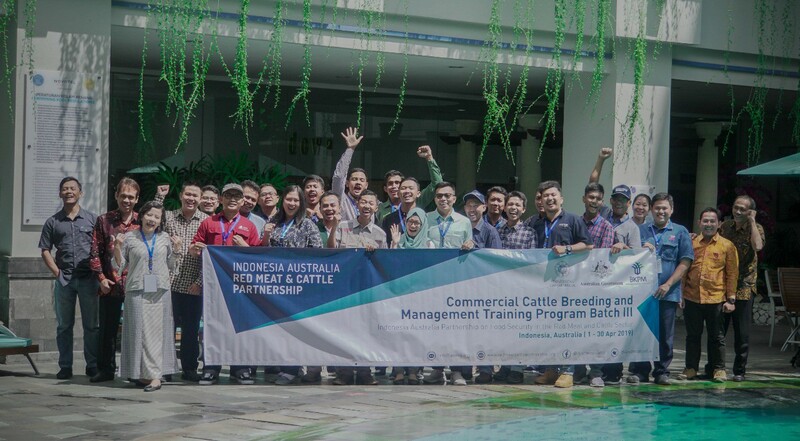 The training will be held held for three weeks, consisting of 2 weeks of training in Indonesia, including in-class training and field visits to various commercial cattle breeding models in Java and Kalimantan; and 1 week of training in Australia for field trips to cattle farms in Queensland. Activities in Indonesia are held on April 1-12 2019 and in Australia on April 21-30 2019. Muhamad Isradi Alireja, Team Leader Advisory and Support Group (ASG) of the Partnership, stated that the purpose of this training is to encourage a more profitable and sustainable model of cattle breeding business in Indonesia. "Through this training, we promote knowledge transfer and exchange of experience between academics and fellow industry players to find skills and knowledge that are most suitable for Indonesia’s cattle sector in achieving global competency and competitiveness"
As a collaborative partner and facilitator of this training program, Prof. Ali Agus, DAA., DEA, Dean of the UGM Faculty of Animal Husbandry stated, "This collaboration is a form of contribution from the academic community to improve the cattle sector in Indonesia, especially in the commercial cattle breeding sector. Good cooperation between universities, industry, and the government is an important factor to strengthen the livestock sector in Indonesia"
Since 2015, the partnership program has allocated AUD 4.2 million for capacity building programs for stakeholders in the red meat and beef sector. With the signing of the Indonesia-Australia Comprehensive Economic Partnership Agreement (IA-CEPA) agreement in early March 2019, the Partnership Program is one of the most relevant programs, especially in terms of increasing Indonesia's human resource capacity that is globally competitive in the red meat and cattle sector.